With this chair’s upcoming release in April 2017, something a bit odd stood out to us about this chair. It doesn’t look like or behave like a normal chair. Instead of sitting in this chair, you actually straddle it like you would an oversized pillow. The main point of the positioning is so that your legs and your feet will hang out over the sides on the floor. What’s the point of that? It’s supposed to help your back and another thing that we immediately noticed is how cheap the chair is. Buddy the game chair is only $43 at this point in time which is the equivalent of about 5,000 yen. 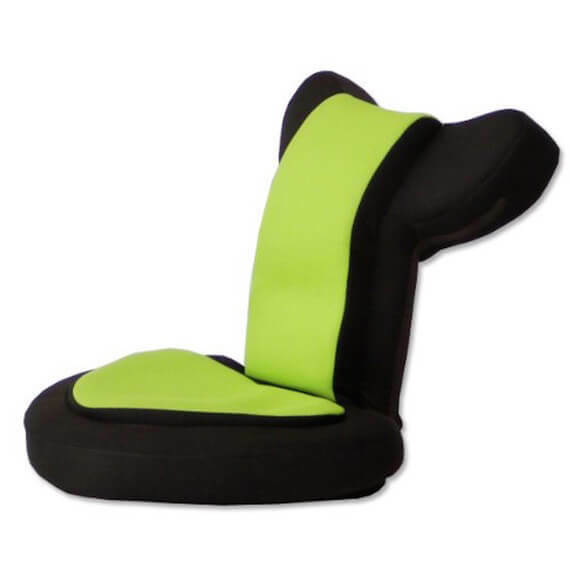 It doubles as a nice backrest for people to lean back in and it comes in a wide assortment of different colors. Q: Can this chair work for larger people? Q: When will this product be available? Q: What different color options are there? With some thick expanding layers of mesh fabric and foam cushion, this chair will more than likely be very comfortable for specific types of users. Obviously, this chair was made for a younger audience and primarily targets gamers but people who enjoy every type of activity can find comfort in this chair. They’ll have to use to get a new seating position they’re not used to. The chair has different reclining positions for leaning back and promotes healthy posture when in the upright position by stretching out your back muscles. The material is 100% polyester on the outside and urethane foam on the inside, so you’ll be more than comfortable when resting in this chair. The overall design is simplistic and is built as a floor chair without armrests. When in an upright position, the outer edge of the headrest can actually act as your armrests for when you’re gaming, reading or watching TV. There’s also a tilting mechanic built in for leaning back when the chair is reclined. There’s a few different color schemes available and all color schemes have the same design. There’s a padded polyester cushion with an additional cushion layer where you’ll be resting. The overall design is very sturdy as well, so you don’t have to worry about falling forward or out of the chair if you have the chair in an upright position. The buddy gaming chair is relatively small with dimensions that measure 54 inches wide, 58 inches deep and 50cm in height. The surface thickness of the seating is 11cm and withstands a lot of pressure. The 14 stage tilt mechanism to help stretch out your back and muscles is built with strength in mind and won’t wear down after repeated use. While the chair’s durability overall is strong, we’d recommend against larger people trying to use the chair because it does come in at a relatively small size. Stitched together with 100% polyester mesh fabric for the outer material, the chair does great with stains and won’t rip easily either. There’s a zipper as well for the inside material if it should ever need replaced. 100% Mesh Fabric Material – We really enjoyed the softness of the mesh fabric inner material which sinks like a cloud when you sit down. The outer material was just as smooth but a bit more durable for people who are prone to stains. Reclining – Attached to the chair is a headrest that allows you to recline back in 14 different stages to ensure every single muscle of your body is stretched out and blood flow is increased to different regions of your body after sitting for prolonged periods. Lightweight – This chair only weighs 3.9kg, so it can easily be picked up and carried around for convenience or storage. Foam Cushion – When the chair’s in an upright position, you can easily relax on the firm but soft foam cushioning. The cushion itself has a very low rebound and you won’t notice any sagging or dipping after a short period of use with the chair. Hikari & Koyo Gear – Attached to the back and the headrest are gears that help recline the chair and give you an optimal seating position to help you not only remain comfortable but support a healthy spine. The gears in the chair also won’t scratch your floor as they’re coated with a double guard for scratch resistance. A: It’s highly unlikely. This chair was built with smaller people in mind so if you’re over 6’ tall or weigh over 250 pounds, you might not get as much enjoyment out of the chair as others would. A: There’s a projected release date of May 19, 2017 but remember that manufacturers can change that date at any time. While the general market for this gaming chair doesn’t have a lot of information on it, it’s still relatively new and it’s not quite released. However, it does look rather promising and for the price tag, it’s kind of a hard offer to pass up. It offers a nice lean back and resting position that most gaming chairs don’t offer. The foam is also very enjoyable to sit on and doesn’t get stale or old after hours of sitting down. It’s a chair you can sit in for a long time without feeling the burn out that’s associated with a lot of other different chairs. We highly recommend this one.